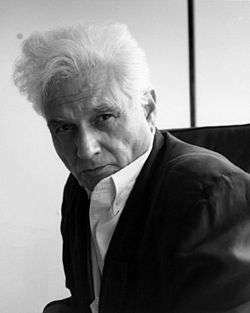 Jacques Derrida (/ʒɑːk ˈdɛrᵻdə/; French: [ʒak dɛʁida]; born Jackie Élie Derrida; July 15, 1930 – October 9, 2004) was a French philosopher, born in Algeria. Derrida is best known for developing a form of semiotic analysis known as deconstruction, which he discussed in numerous texts, and developed in the context of phenomenology. He is one of the major figures associated with post-structuralism and postmodern philosophy. During his career Derrida published more than 40 books, together with hundreds of essays and public presentations. He had a significant influence upon the humanities and social sciences, including—in addition to philosophy and literature—law, anthropology, historiography, linguistics, sociolinguistics, psychoanalysis, political theory, religious studies, feminism, and gay and lesbian studies. His work still has a major influence in the academe of Continental Europe, South America and all other countries where continental philosophy is predominant, particularly in debates around ontology, epistemology (especially concerning social sciences), ethics, aesthetics, hermeneutics, and the philosophy of language. He also influenced architecture (in the form of deconstructivism), music, art, and art criticism. Particularly in his later writings, Derrida addressed ethical and political themes in his work. Some critics consider Speech and Phenomena (1967) to be his most important work. Others cite Of Grammatology, Writing and Difference, and Margins of Philosophy. These writings influenced various activists and political movements. He became a well-known and influential public figure, while his approach to philosophy and the notorious difficulty of his work made him controversial. Derrida was born at daybreak on July 15, 1930, in a summer home in El Biar (Algiers), Algeria, into a Sephardic Jewish family (originally from Toledo) that became French in 1870 when the Crémieux Decree granted full French citizenship to the indigenous Arabic-speaking Jews of Algeria. His parents, Haïm Aaron Prosper Charles (Aimé) Derrida (1896–1970) and Georgette Sultana Esther Safar (1901–1991), named him "Jackie", "which they considered to be an American name", though he would later adopt a more "correct" version of his first name when he moved to Paris; some reports indicate that he was named Jackie after the American child actor Jackie Coogan, who had become well-known around the world via his role in the 1921 Charlie Chaplin film The Kid. He was also given the middle name Élie after his paternal uncle Eugène Eliahou, at his circumcision; this name was not recorded on his birth certificate unlike those of his siblings, and he would later call it his "hidden name". On the first day of the school year in 1942, French administrators in Algeria — implementing anti-Semitic quotas set by the Vichy government — expelled Derrida from his lycée. He secretly skipped school for a year rather than attend the Jewish lycée formed by displaced teachers and students, and also took part in numerous football competitions (he dreamed of becoming a professional player). In this adolescent period, Derrida found in the works of philosophers and writers (such as Rousseau, Nietzsche, and Gide) an instrument of revolt against family and society. His reading also included Camus and Sartre. In the late 1940s, he attended the Lycée Bugeaud and the Lycée Louis-le-Grand, where his professor of philosophy was Étienne Borne. On his first day at the École Normale Supérieure (ENS) in Paris in 1952, Derrida met Louis Althusser, with whom he became friends. After visiting the Husserl Archive in Leuven, Belgium (1953–1954), he completed his master's degree in philosophy (diplôme d'études supérieures) on Edmund Husserl (see below). He then passed the highly competitive agrégation exam in 1956. Derrida received a grant for studies at Harvard University, and he spent the 1956–57 academic year reading Joyce's Ulysses at the Widener Library. In June 1957, he married the psychoanalyst Marguerite Aucouturier in Boston. During the Algerian War of Independence of 1954–1962, Derrida asked to teach soldiers' children in lieu of military service, teaching French and English from 1957 to 1959. Following the war, from 1960 to 1964, Derrida taught philosophy at the Sorbonne, where he was an assistant of Suzanne Bachelard (daughter of Gaston), Georges Canguilhem, Paul Ricœur (who in these years coined the term school of suspicion) and Jean Wahl. His wife, Marguerite, gave birth to their first child, Pierre, in 1963. In 1964, on the recommendation of Louis Althusser and Jean Hyppolite, Derrida got a permanent teaching position at the ENS, which he kept until 1984. In 1965 Derrida began an association with the Tel Quel group of literary and philosophical theorists, which lasted for seven years. Derrida's subsequent distance from the Tel Quel group, after 1971, has been attributed to his reservations about their embrace of Maoism and of the Chinese Cultural Revolution. Derrida was a regular visiting professor at several other major American and European universities, including Johns Hopkins University, Yale University, New York University, Stony Brook University and The New School for Social Research. He was awarded honorary doctorates by the University of Cambridge (1992), Columbia University, The New School for Social Research, the University of Essex, Katholieke Universiteit Leuven, the University of Silesia, the University of Coimbra and many others around the world. Derrida was a member of the American Academy of Arts and Sciences. Although his membership in Class IV, Section 1 (Philosophy and Religious Studies) was rejected; he was subsequently elected to Class IV, Section 3 (Literary Criticism, including Philology). He received the 2001 Adorno-Preis from the University of Frankfurt. At the time of his death, Derrida had agreed to go for the summer to Heidelberg as holder of the Gadamer professorship, whose invitation was expressed by the hermeneutic philosopher himself before his death. Prof. Dr. Peter Hommelhoff, Rector at Heidelberg by that time, would summarize Derrida's place as: "Beyond the boundaries of philosophy as an academic discipline he was a leading intellectual figure not only for the humanities but for the cultural perception of a whole age." On multiple occasions, Derrida referred to himself as a historian. Derrida questioned assumptions of the Western philosophical tradition and also more broadly Western culture. By questioning the dominant discourses, and trying to modify them, he attempted to democratize the university scene and to politicize it. Derrida called his challenge to the assumptions of Western culture "deconstruction". On some occasions, Derrida referred to deconstruction as a radicalization of a certain spirit of Marxism. With his detailed readings of works from Plato to Rousseau to Heidegger, Derrida frequently argues that Western philosophy has uncritically allowed metaphorical depth models to govern its conception of language and consciousness. He sees these often unacknowledged assumptions as part of a "metaphysics of presence" to which philosophy has bound itself. This "logocentrism," Derrida argues, creates "marked" or hierarchized binary oppositions that have an effect on everything from our conception of speech's relation to writing to our understanding of racial difference. Deconstruction is an attempt to expose and undermine such metaphysics. Perhaps Derrida's most quoted and famous assertion, which appears in an essay on Rousseau in his book Of Grammatology (1967), is the statement that "there is no out-of-context" (il n'y a pas de hors-texte). Critics of Derrida have been often accused of having mistranslated the phrase in French to suggest he had written "Il n'y a rien en dehors du texte" ("There is nothing outside the text") and of having widely disseminated this translation to make it appear that Derrida is suggesting that nothing exists but words. Derrida once explained that this assertion "which for some has become a sort of slogan, in general so badly understood, of deconstruction (...) means nothing else: there is nothing outside context. In this form, which says exactly the same thing, the formula would doubtless have been less shocking.". In the early 1960s, Derrida began speaking and writing publicly, addressing the most topical debates at the time. One of these was the new and increasingly fashionable movement of structuralism, which was being widely favoured as the successor to the phenomenology approach, the latter having been started by Husserl sixty years earlier. Derrida's countercurrent take on the issue, at a prominent international conference, was so influential that it reframed the discussion from a celebration of the triumph of structuralism to a "phenomenology vs structuralism debate." In that context, in 1959, Derrida asked the question: Must not structure have a genesis, and must not the origin, the point of genesis, be already structured, in order to be the genesis of something? In other words, every structural or "synchronic" phenomenon has a history, and the structure cannot be understood without understanding its genesis. At the same time, in order that there be movement, or potential, the origin cannot be some pure unity or simplicity, but must already be articulated—complex—such that from it a "diachronic" process can emerge. This originary complexity must not be understood as an original positing, but more like a default of origin, which Derrida refers to as iterability, inscription, or textuality. It is this thought of originary complexity that sets Derrida's work in motion, and from which all of its terms are derived, including "deconstruction". Derrida's interests traversed disciplinary boundaries, and his knowledge of a wide array of diverse material was reflected in the three collections of work published in 1967: Speech and Phenomena, Of Grammatology (initially submitted as a Doctorat de spécialité thesis under Maurice de Gandillac), and Writing and Difference. On several occasions Derrida has acknowledged his debt to Husserl and Heidegger, and stated that without them he would have not said a single word. Among the questions asked in these essays are "What is 'meaning', what are its historical relationships to what is purportedly identified under the rubric 'voice' as a value of presence, presence of the object, presence of meaning to consciousness, self-presence in so called living speech and in self-consciousness?" In another essay in Writing and Difference entitled "Violence and Metaphysics: An Essay on the Thought of Emmanuel Levinas", the roots of another major theme in Derrida's thought emerges: the Other as opposed to the Same "Deconstructive analysis deprives the present of its prestige and exposes it to something tout autre, "wholly other," beyond what is foreseeable from the present, beyond the horizon of the "same"." Other than Rousseau, Husserl, Heidegger and Levinas, these three books discussed, and/or relied upon, the works of many philosophers and authors, including linguist Saussure, Hegel, Foucault, Bataille, Descartes, anthropologist Lévi-Strauss, paleontologist Leroi-Gourhan, psychoanalyst Freud, and writers such as Jabès and Artaud. In 1968, he published his influential essay "Plato's Pharmacy" in the French journal Tel Quel . This essay was later collected in Dissemination, one of three books published by Derrida in 1972, along with the essay collection Margins of Philosophy and the collection of interviews entitled Positions. Starting in 1972, Derrida produced on average more than a book per year. Derrida continued to produce important works, such as Glas (1974) and The Post Card: From Socrates to Freud and Beyond (1980). Derrida received increasing attention in the United States after 1972, where he was a regular visiting professor and lecturer at several major American universities. In the 1980s, during the American culture wars, conservatives started a dispute over Derrida's influence and legacy upon American intellectuals, and claimed that he influenced American literary critics and theorists more than academic philosophers. Of Spirit is an important contribution to the long debate on Heidegger's Nazism and appeared at the same time as the French publication of a book by a previously unknown Chilean writer, Victor Farías, who charged that Heidegger's philosophy amounted to a wholehearted endorsement of the Nazi Sturmabteilung (SA) faction. Derrida responded to Farías in an interview, "Heidegger, the Philosopher's Hell" and a subsequent article, "Comment donner raison? How to Concede, with Reasons?" He called Farías a weak reader of Heidegger's thought, adding that much of the evidence Farías and his supporters touted as new had long been known within the philosophical community. Some have argued that Derrida's work took a "political turn" in the 1990s. Texts cited as evidence of such a turn include Force of Law (1990), as well as Specters of Marx (1994) and Politics of Friendship (1994). Others, however, including Derrida himself, have argued that much of the philosophical work done in his "political turn" can be dated to earlier essays. Derrida delivered a eulogy at Levinas' funeral, later published as Adieu à Emmanuel Lévinas, an appreciation and exploration of Levinas's moral philosophy. Derrida utilized Bracha L. Ettinger's interpretation of Lévinas' notion of femininity and transformed his own earlier reading of this subject respectively. In the October 2002, at the theatrical opening of the film Derrida, he said that, in many ways, he felt more and more close to Guy Debord's work, and that this closeness appears in Derrida's texts. Derrida mentioned, in particular, "everything I say about the media, technology, the spectacle, and the 'criticism of the show', so to speak, and the markets – the becoming-a-spectacle of everything, and the exploitation of the spectacle." Among the places in which Derrida mentions the Spectacle, a 1997 interview about the notion of the intellectual. He met with Palestinian intellectuals during a 1988 visit to Jerusalem. He was active in the collective "89 for equality", which campaigned for the right of foreigners to vote in local elections. In the 2002 French presidential election he refused to vote in the run-off between far right leader Jean-Marie Le Pen and Jacques Chirac, citing a lack of acceptable choices. Crucial readings in his adolescence were Rousseau's Reveries of a Solitary Walker and Confessions, André Gide's journal, La porte étroite, Les nourritures terrestres and The Immoralist; and the works of Friedrich Nietzsche. The phrase Families, I hate you! in particular, which inspired Derrida as an adolescent, is a famous verse from Gide's Les nourritures terrestres, book IV. In a 1991 interview Derrida commented on a similar verse, also from book IV of the same Gide work: "I hated the homes, the families, all the places where man thinks to find rest" (Je haïssais les foyers, les familles, tous lieux où l'homme pense trouver un repos). Derrida's philosophical friends, allies, and students included Paul de Man, Jean-François Lyotard, Michel Foucault, Louis Althusser, Emmanuel Levinas, Maurice Blanchot, Gilles Deleuze, Jean-Luc Nancy, Philippe Lacoue-Labarthe, Sarah Kofman, Hélène Cixous, Bernard Stiegler, Alexander García Düttmann, Joseph Cohen, Geoffrey Bennington, Jean-Luc Marion, Gayatri Chakravorty Spivak, Raphael Zagury-Orly, Jacques Ehrmann, Avital Ronell, Judith Butler, Ernesto Laclau, Samuel Weber and Catherine Malabou. Jean-Luc Nancy and Philippe Lacoue-Labarthe were among Derrida's first students in France and went on to become well-known and important philosophers in their own right. Despite their considerable differences of subject, and often also of method, they continued their close interaction with each other and with Derrida, from the early 1970s. Derrida complicated the notion that it is possible to simply read de Man's later scholarship through the prism of these earlier political essays. Rather, any claims about de Man's work should be understood in relation to the entire body of his scholarship. Critics of Derrida have argued that he minimizes the antisemitic character of de Man's writing. Some critics have found Derrida's treatment of this issue surprising, given that, for example, Derrida also spoke out against antisemitism and, in the 1960s, broke with the Heidegger disciple Jean Beaufret over a phrase of Beaufret's that Derrida (and, after him, Maurice Blanchot) interpreted as antisemitic. Having started as a student of de Man, Gayatri Spivak took on the translation of Of Grammatology early in her career and has since revised it into a second edition. Barbara Johnson's translation of Derrida's Dissimination was published by The Athlone Press in 1981. Alan Bass was responsible for several early translations; Bennington and Peggy Kamuf have continued to produce translations of his work for nearly twenty years. In recent years, a number of translations have appeared by Michael Naas (also a Derrida scholar) and Pascale-Anne Brault. I think that there is an ideology in McLuhan's discourse that I don't agree with, because he's an optimist as to the possibility of restoring an oral community which would get rid of the writing machines and so on. I think that's a very traditional myth which goes back to... let's say Plato, Rousseau... And instead of thinking that we are living at the end of writing, I think that in another sense we are living in the extension – the overwhelming extension – of writing. At least in the new sense... I don't mean the alphabetic writing down, but in the new sense of those writing machines that we're using now (e.g. the tape recorder). And this is writing too. In a paper entitled Ghostwriting Gayatri Chakravorty Spivak—the translator of Derrida's De la grammatologie (Of Grammatology) into English—criticised Derrida's understanding of Marx. Commenting on Derrida's Specters of Marx, Terry Eagleton wrote "The portentousness is ingrained in the very letter of this book, as one theatrically inflected rhetorical question tumbles hard on the heels of another in a tiresomely mannered syntax which lays itself wide open to parody." Though Derrida addressed the American Philosophical Association at least on one occasion in 1988, and was highly regarded by some contemporary philosophers like Richard Rorty, Alexander Nehamas, and Stanley Cavell, however, his work has been regarded by other analytic philosophers, such as John Searle and Willard Van Orman Quine, as pseudophilosophy or sophistry. Three quarrels (or disputes) in particular went out of academic circles and received international mass media coverage: the 1972–88 quarrel with John Searle, the analytic philosophers' pressures on Cambridge University not to award Derrida an honorary degree and a dispute with Richard Wolin and the NYRB. what is "nonfiction standard discourse," what must it be and what does this name evoke, once its fictionality or its fictionalization, its transgressive "parasitism," is always possible (and moreover by virtue of the very same words, the same phrases, the same grammar, etc.)? This question is all the more indispensable since the rules, and even the statements of the rules governing the relations of "nonfiction standard discourse" and its fictional"parasites," are not things found in nature, but laws, symbolic inventions, or conventions, institutions that, in their very normality as well as in their normativity, entail something of the fictional. In the debate, Derrida praises Austin's work, but argues that he is wrong to banish what Austin calls "infelicities" from the "normal" operation of language. One "infelicity," for instance, occurs when it cannot be known whether a given speech act is "sincere" or "merely citational" (and therefore possibly ironic, etc.). Derrida argues that every iteration is necessarily "citational," due to the graphematic nature of speech and writing, and that language could not work at all without the ever-present and ineradicable possibility of such alternate readings. Derrida takes Searle to task for his attempt to get around this issue by grounding final authority in the speaker's inaccessible "intention". Derrida argues that intention cannot possibly govern how an iteration signifies, once it becomes hearable or readable. All speech acts borrow a language whose significance is determined by historical-linguistic context, and by the alternate possibilities that this context makes possible. This significance, Derrida argues, cannot be altered or governed by the whims of intention. (c) when the reformulation from (b) is acknowledged then proceed as if the original formulation from (a) was accepted. The revised idea—-for example—-that everything exists in some context is a banality but a charade ensues as if the original claim--nothing exists outside of text [sic]--had been established. Derrida has often been the target of attacks by analytic philosophers; an attack of major significance was their 1992 attempt at stopping Cambridge University from granting Derrida an Honorary Doctorate. In the end the protesters were outnumbered—336 votes to 204—when Cambridge put the motion to a vote; though almost all of those voting in favour were not from the philosophy faculty. Derrida suggested in an interview that part of the reason for the attacks on his work, was that it questioned and modified "the rules of the dominant discourse, it tries to politicize and democratize education and the university scene." To answer the question about the "exceptional violence," the compulsive "ferocity," and the "exaggeration" of the "attacks," he would say that these critics organize and practice in his case "a sort of obsessive personality cult which philosophers should know how to question and above all to moderate". Critical obituaries of Derrida were published in The New York Times, The Economist, and The Independent. The magazine The Nation responded to the NYT obituary saying that "even though American papers had scorned and trivialized Derrida before, the tone seemed particularly caustic for an obituary of an internationally acclaimed philosopher who had profoundly influenced two generations of American humanities scholars." The Archeology of the Frivolous: Reading Condillac, trans. John P. Leavey, Jr. (Lincoln & London: University of Nebraska Press, 1980). 1 2 Peeters, Benoît (2012). Derrida: A Biography. Polity. pp. 12–13. Jackie was born at daybreak, on 15 July 1930, at El Biar, in the hilly suburbs of Algiers, in a holiday home. [...] The boy's main forename was probably chosen because of Jackie Coogan ... When he was circumcised, he was given a second forename, Elie, which was not entered on his birth certificate, unlike the equivalent names of his brother and sister. . See also Bennington, Geoffrey (1993). Jacques Derrida. The University of Chicago Press. p. 325. 1930 Birth of Jackie Derrida, July 15, in El-Biar (near Algiers, in a holiday house). .
1 2 Jonathan Kandell (October 10, 2004). "Jacques Derrida, Abstruse Theorist, Dies at 74". ↑ John D. Caputo, Radical Hermeneutics: Repetition, Deconstruction, and the Hermeneutic Project, Indiana University Press, 1988, p. 5: "Derrida is the turning point for radical hermeneutics, the point where hermeneutics is pushed to the brink. Radical hermeneutics situates itself in the space which is opened up by the exchange between Heidegger and Derrida..."
↑ Derrida on Religion: Thinker of Differance By Dawne McCance. Equinox. p. 7. ↑ Derrida, Deconstruction, and the Politics of Pedagogy (Counterpoints Studies in the Postmodern Theory of Education). Peter Lang Publishing Inc. p. 134. 1 2 Bensmaïa, Réda, "Poststructuralism", in Kritzman (2005), pp. 92–93. 1 2 Poster (1988), pp. 5–6. ↑ Derrida, Jacques (1992). ""Force of Law"". Deconstruction and the Possibility of Justice. translated by Mary Quaintance, eds., Drucilla Cornell, Michael Rosenfeld, and David Gray Carlson (1st ed.). New York: Routledge. pp. 3–67. ISBN 0810103974. “A decision that did not go through the ordeal of the undecidable would not be a free decision, it would only be the programmable application or unfolding of a calculable process (...) deconstructs from the inside every assurance of presence, and thus every criteriology that would assure us of the justice of the decision. ↑ "I took part in the extraordinary transformation of the Algerian Jews; my great-grandparents were by language, custom, etc., still identified with Arabic culture. After the Cremieux Decree (1870), at the end of the 19th c., the following generation became bourgeois", Jacques Derrida The Last Interview, May 2003. ↑ "Haim, Aaron, Prosper, Charles, Aimé Aimé, Mémé - Arbre Familial des Zaffran (Zafran et Safran), Miguéres, Gharbi, Allouche, Safar, Temime etc... - GeneaNet". Gw4.geneanet.org. 18 January 2012. Retrieved 21 October 2012. ↑ "Safar surname: occupational name from Arabic saffar which means worker in copper or brass", The Safar surname"
1 2 Powell (2006), p. 12. ↑ Cixous (2001), p. vii; also see this interview with Derrida's long-term collaborator John Caputo. 1 2 3 Alan D. Schrift (2006), Twentieth-Century French Philosophy: Key Themes And Thinkers, Blackwell Publishing, p. 120. ↑ Marc Goldschmidt, Jacques Derrida : une introduction, 2003, p. 231. ↑ Caputo (1997), p. 25. ↑ Leslie Hill, The Cambridge Introduction to Jacques Derrida, Cambridge: Cambridge University Press, 2007, p. 55. 1 2 3 Powell (2006), p. 145. ↑ "Obituary: Jacques Derrida", by Derek Attridge and Thomas Baldwin, The Guardian, October 11, 2004. Retrieved Jan 19, 2010. ↑ Jacques Derrida Dies; Deconstructionist Philosopher, accessed May 9, 2012. 1 2 "The University of Heidelberg Mourns the Death of Jacques Derrida"
↑ Derrida (1992) Cambridge Review, pp. 404, 408–13. ↑ Derrida, Jacques (1993). "Spectres of Marx" (in French): 92. ↑ Reilly, Brian J. (2005) Jacques Derrida, in Kritzman (2005), p. 500. ↑ Sullivan, Patricia (2004) Jacques Derrida Dies; Deconstructionist Philosopher, in Washington Post, October 10, 2004, p. C11, accessed August 2, 2007. ↑ Glendinning, Simon (2011). Jacques Derrida: A Very Short Introduction. Oxford University Press. ↑ The dissertation was eventually published in 1990 with the title Le problème de la genèse dans la philosophie de Husserl. English translation: The Problem of Genesis in Husserl's Philosophy (2003). ↑ J. Derrida (1967), interview with Henri Ronse, p. 5. ↑ Jacques Derrida, "Structure, Sign, and Play in the Discourse of the Human Sciences," in Writing and Difference, trans. Alan Bass (Chicago: University of Chicago Press, 1978), p. 278. — "Structure, Sign and Play" in Writing and Difference, p. 353. It is an opening that is structural, or the structurality of an opening. Yet each of these concepts excludes the other. It is thus as little a structure as it is an opening; it is as little static as it is genetic, as little structural as it is historical. It can be understood neither from a genetic nor from a structuralist and taxonomic point of view, nor from a combination of both points of view. 1 2 Derrida (1967) interview with Henri Ronse, pp. 4–5: "[Speech and Phenomena] is perhaps the essay which I like most. Doubtless I could have bound it as a long note to one or the other of the other two works. Of Grammatology refers to it and economizes its development. But in a classical philosophical architecture, Speech... would come first: in it is posed, at a point which appears juridically decisive for reasons that I cannot explain here, the question of the privilege of the voice and of phonetic writing in their relationship to the entire history of the West, such as this history can be represented by the history of metaphysics and metaphysics in its most modern, critical and vigilant form: Husserl's transcendental phenomenology." 1 2 On the influence of Heidegger, Derrida claims in his "Letter to a Japanese Friend" (Derrida and différance, eds. Robert Bernasconi and David Wood) that the word "déconstruction" was his attempt both to translate and re-appropriate for his own ends the Heideggerian terms Destruktion and Abbau, via a word from the French language, the varied senses of which seemed consistent with his requirements. This relationship with the Heideggerian term was chosen over the Nietzschean term "demolition," as Derrida shared Heidegger's interest in renovating philosophy. ↑ Derrida, J. Violence and Metaphysics: An Essay on the Thought of Emmanuel Levinas, Writing and Difference. Chicago: University of Chicago. 97–192. ↑ Of Grammatology, pp. 83–86. ↑ "Edmond Jabès and the Question of the Book" and "Ellipsis" in Writing and Difference, pp. 64-78 and 295-300. 1 2 3 Wayne A. Borody (1998) pp. 3, 5 Figuring the Phallogocentric Argument with Respect to the Classical Greek Philosophical Tradition Nebula: A Netzine of the Arts and Science, Vol. 13 (pp. 1–27). ↑ Spurgin, Tim (1997) Reader's Guide to Derrida's "Plato's Pharmacy"
1 2 Sven Ove Hansson Philosophical Schools at the Wayback Machine (archived July 18, 2006) – Editorial From Theoria vol. 72, Part 1 (2006). ↑ Powell (2006), p. 167. ↑ B. L. Ettinger in conversation with Emmanuel Lévinas, "Que dirait Eurydice?" / "What would Eurydice Say?" (1991-93). Reprinted to coincide with Kabinet exhibition at Stedelijk Museum, Amsterdam. Paris: BLE Atelier, 1997. This is a reprint of Le féminin est cette différence inouïe (Livre d'artiste, 1994, and it includes the text of Time is the Breath of the Spirit, MOMA, Oxford, 1993.) Reprinted in Athena: Philosophical Studies. Vol. 2, 2006. ↑ Derrida (1991) "A 'Madness' Must Watch Over Thinking", pp. 347–9. ↑ Jacques Derrida, "'To Do Justice to Freud': The History of Madness in the Age of Psychoanalysis," Resistances of Psychoanalysis (Stanford: Stanford University Press, 1998) pp. 70–1. ↑ Peeters, Benoit (2013-08-27). Derrida: A Biography. John Wiley & Sons. ISBN 9780745663029. ↑ Pearson, Roger (2010-05-15). Stéphane Mallarmé. Reaktion Books. p. 217. ISBN 9781861897275. ↑ Foucault, Michel, History of Madness, ed. Jean Khalfa, trans. Jonathan Murphy and Jean Khalfa (London: Routledge, 2006), p. xxiv,573. ↑ "Derrida Seminar Translation Project". Derridaseminars.org. Retrieved 21 October 2012. ↑ "Derrida Seminar Translation Project". Derridaseminars.org. Retrieved 1 January 2014. ↑ "Lovely Luton". Hydra.humanities.uci.edu. Retrieved 21 October 2012. ↑ Spivak, Gayatri Chakravorty (1995). "Ghostwriting". Diacritics. The Johns Hopkins University Press. 25 (2): 64–84. doi:10.2307/465145. JSTOR 465145. ↑ |Jacques Derrida|Marx & Sons| Sprinker, Michael, ed. (2008). "Chapter 10: Marx & Sons". Ghostly Deamarctations: A Symposium On Jacques Derrida's "Specters of Marx". chapter by Jacques Derrida. London: Verso. p. 223. ISBN 9781844672110. ↑ Sprinker, Michael, ed. (2008). "Chapter 5: Marxism without Marx". Ghostly Deamarctations: A Symposium On Jacques Derrida's "Specters of Marx". chapter by Terry Eagleton. London: Verso. pp. 83–7. ISBN 9781844672110. ↑ "Truth and Consequences: How to Understand Jacques Derrida," The New Republic 197:14 (October 5, 1987). ↑ J.E. D'Ulisse, Derrida (1930–2004), New Partisan, December 24, 2004. Archived April 24, 2015, at the Wayback Machine. ↑ Rorty, Richard. Contingency, Irony, and Solidarity. Cambridge: Cambridge University Press, 1989. ISBN 0-521-36781-6. Ch. 6: "From ironist theory to private allusions: Derrida"
↑ Chomsky, Noam (August 2012). "Postmodernism?". ZCommunications. Retrieved 27 September 2014. 1 2 3 Searle, John R. (1994). "Literary Theory and Its Discontents". Journal of Humanistic Psychology. The Johns Hopkins University Press. 25 (3): 637–67. doi:10.2307/469470. JSTOR 469470. ↑ Searle, John R. (27 October 1983). "The Word Turned Upside Down". The New York Review of Books. NYREV, Inc. Archived from the original on October 13, 2012. Retrieved 21 August 2013. ↑ "Derrida, Searle, Contexts, Games, Riddles". Edmond Wright. New Literary History, Vol. 13, No. 3 ("Theory: Parodies, Puzzles, Paradigms"), Spring 1982, pp. 463-477. ↑ Derrida, Jacques (1988). "Afterword: Toward An Ethic of Discussion". Limited Inc. (1st ed.). Illinois: Northwestern University Press. p. 136. ISBN 0810107880. The phrase which for some has become a sort of slogan, in general so badly understood, of deconstruction ("there is no outside-text" [it n y a pas de hors-texte]), means nothing else: there is nothing outside context. In this form, which says exactly the same thing, the formula would doubtless have been less shocking. I am not certain that it would have provided more to think about. ↑ Barry Smith et al., "Open letter against Derrida receiving an honorary doctorate from Cambridge University," The Times [London], 9 May 1992. ↑ Derrida, Jacques (1995). ""Honoris Causa: 'This is also very funny'"". Points . .: Interviews, 1974-1994 (1st ed.). New York: Stanford University Press. pp. 409–413. ISBN 0810103974. If it were only a question of "my" work, of the particular or isolated research of one individual, this wouldn't happen. Indeed, the violence of these denunciations derives from the fact that the work accused is part of a whole ongoing process. What is unfolding here, like the resistance it necessarily arouses, can't be limited to a personal "oeuvre," nor to a discipline, nor even to the academic institution. Nor in particular to a generation: it's often the active involvement of students and younger teachers which makes certain of our colleagues nervous to the point that they lose their sense of moderation and of the academic rules they invoke when they attack me and my work. ↑ Derrida, "The Work of Intellectuals and the Press (The Bad Example: How the New York Review of Books and Company do Business)," published in the book Points... (1995; see the footnote about ISBN 0-226-14314-7, here) (see also the  French Version Points de suspension: entretiens (ISBN 0-8047-2488-1) there). ↑ Jacques Derrida. "Of Grammatology by Jacques Derrida". Marxists.org. Retrieved 21 October 2012. Geoffrey Bennington (1991). Jacques Derrida, University of Chicago Press. Section Curriculum vitae, pp. 325–36. Excerpts. Cixous, Hélène (2001). Portrait of Jacques Derrida as a Young Jewish Saint (English edition, New York: Columbia University Press, 2004). Rabaté, Jean-Michel. Jacques Derrida at the Wayback Machine (archived May 3, 2003) Johns Hopkins Guide to Literary Theory. Mario Perniola, Remembering Derrida, in "SubStance" (Univ. of California), 2005, n.1, issue 106.